The Islamic State group may have lost all its territory in Syria but a rival jihadist group has been making gains in the last remaining opposition stronghold in the north of the country - and it has got residents nervous. In a dramatic takeover last month, Hayat Tahrir al-Sham (HTS) swept through towns and villages in Idlib province, as well as adjoining parts of Aleppo and Hama. 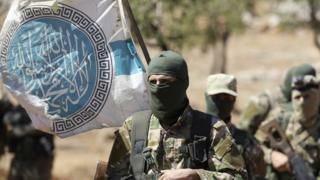 The group - which was known as al-Nusra Front before it broke off formal ties with al-Qaeda three years ago - expelled some rebel factions and forced others to surrender and recognise a "civil administration" it backs. With almost 20,000 fighters in its ranks, HTS wants to impose strict Islamic rule in areas it controls. Civilians say the group's practices are similar to those of IS. Hiba, a civil society worker in her mid-20s based in western Aleppo countryside, worries that women like her will be deprived of their rights, similar to what IS did in areas it captured. International aid organisations have already suspended their work fearing reprisals by the group. "This will affect many women who work with these organisations, and who earn their living and are empowered by the work," Hiba warned. Most residents of areas that have fallen to HTS do not support the group's agenda. "This is what we have been facing for the past eight years; someone who opposes us and tries to exterminate us," said Issam Khatib, who runs a Turkey-based civil society organisation that operates in western Aleppo. Mohammed, who lives in the same area, told the BBC that HTS did not represent the people and was not welcome there. "This black colour is imposed on us," he said, in reference to the extremist agenda the group holds. "We really don't know who supports them; they have a power where no-one is able to face them." The HTS takeover has also jeopardised the truce brokered by Turkey and Russia that has spared the 2.9 million civilians living in the enclave - including close to one million children - from a bloody government assault and a humanitarian disaster. The truce deal established a demilitarised buffer zone running along the front line to separate opposition and government forces. Rebels were required to pull their heavy weapons out of the zone, and jihadists were told to withdraw altogether. Residents are worried that the government, which is supported by Russia and Iran, will use the jihadists' gains as justification to resume their bombardment and eventually launch a full-scale ground offensive. There have been sporadic clashes along the front line since the truce began in September. But in recent weeks Idlib has been shaken by government shelling that has killed more than a dozen civilians, as well as a number of bomb attacks blamed on IS sleeper cells. Some residents are pinning their hopes on Turkey to intervene to save the truce and curb HTS's power. Why does the battle for Idlib matter? One Turkish newspaper close to the government has reported that 15,000 HTS fighters are willing to join the so-called National Army, a force created by Turkey in an attempt to unify the opposition in north-western Syria. "For me this is a sign there is some sort of a deal to avoid a major regime offensive," said Mr Khatib. However, President Donald Trump's decision to withdraw US troops from Syria, where they have been supporting a Kurdish militia battling IS, may change the dynamics. Turkey considers the militia, the People's Protection Units, an extension of a banned Kurdish rebel group in Turkey and it has vowed to set up a "security zone" with its allies inside Syria to prevent cross-border attacks. The presence of HTS - which is designated as a terrorist organisation by Turkey, along with the UN, the US and other Western powers - has already hit civilians living in opposition-held north-western Syria hard. At the end of September, the US and UK stopped aid they funded going through the key Bab al-Hawa crossing on Turkey's border with Idlib, saying they wanted to prevent extremists from benefiting from taxes they imposed on aid lorries. And after the latest HTS offensive, some international agencies suspended funding for medical services, prompting local health authorities to warn that dozens of facilities would have to cease operations or rely on staff working without pay. The UN has said it is still committed to its support for the millions of civilians in need throughout the opposition enclave. But Sham, an architect involved in civil society initiatives in Idlib, said civilians there were very alarmed by international funding cuts. "Those who have a job today will lose it tomorrow," she said. "Education, health facilities, and many other services will be affected." It is still not clear what will happen in the enclave, as the situation is still so fluid. But the fears of the civilians living there will not change.